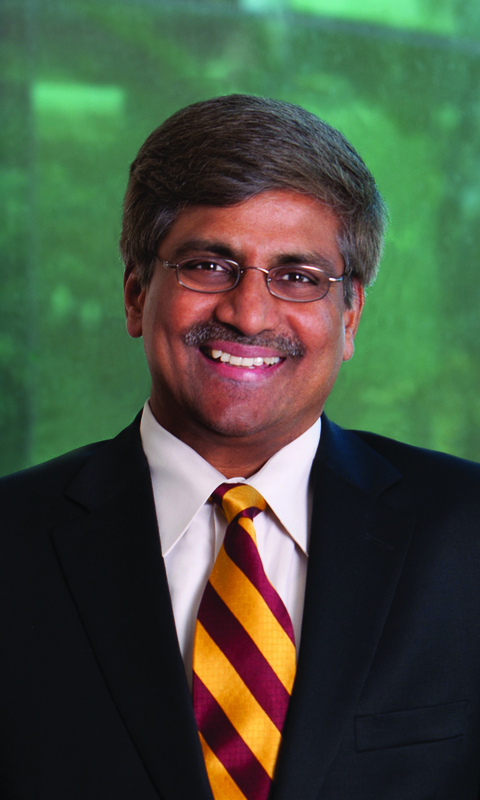 In honor of his extensive contributions to the disciplines of multimedia computing and informatics, and leadership in advancing science and technology globally, Arizona State University’s Chief Research and Innovation Officer Sethuraman “Panch” Panchanathan has been recognized as a distinguished alumnus by two of his alma maters, the Indian Institute of Technology-Madras (IIT Madras) and the University of Ottawa-Canada. Students and researchers in CUbiC design and engineer technologies and devices that assist individuals with disabilities. Several of the center’s technologies and devices have received national and international recognition, including winning the Microsoft Imagine World Cup. Arizona State University's Chief Research and Innovation Officer Sethuraman Panchanathan (second from right) with other honorees at the University of Ottawa's 2017 Alumni Association Awards of Excellence ceremony. Sethuraman Panchanathan (left), executive vice president of Knowledge Enterprise Development and chief research and innovation officer at ASU, receives the Distinguished Alumnus Award at the Indian Institute of Technology-Madras. Panchanathan serves as the executive vice president of Knowledge Enterprise Development at ASU and is recognized globally as a leader in education, research and innovation. Under his leadership, ASU’s research enterprise has flourished, rapidly growing to reach nearly $520 million in research expenditures in 2016. U.S. News & World Report named ASU the most innovative school in the U.S. in 2015 and 2016. His professional recognitions include fellowships with scientific and professional organizations such as the National Academy of Inventors (NAI), Institute of Electrical and Electronics Engineers (IEEE), the International Society for Optical Engineering (SPIE), and the Canadian Academy of Engineering (CAE). In 2014, President Barack Obama appointed Panchanathan to the National Science Board for a six-year term, where he currently chairs the Committee on Strategy. He has also served on the U.S. Secretary of Commerce’s National Advisory Council on Innovation and Entrepreneurship. He is an advisor to Arizona Secretary of State Michele Reagan as part of her Technology, Transparency and Commerce Council that provides strategic insight on policy matters. As an electrical engineer, Associate Professor Jennifer Blain Christen has spent a good portion of her career dabbling in different fields. The project aims to develop a disposable, point-of-care biosensor for rapid diagnosis and health monitoring, supported by a four-year, $1.8 million Smart and Connected Health award from the National Science Foundation. Working in conjunction with Arizona State University’s Flexible Display Center and Professor Karen Anderson of the Biodesign Institute and the School of Life Sciences, Blain Christen envisions a sweat-absorbing patch about the size of a nicotine or birth control patch with the ability to provide an immediate window into a patient’s health. This is accomplished with a small screen within the patch, much like a miniature TV screen, which uses light to examine molecules within sweat. The screen projects light through the molecules, and the color of light that emerges indicates the presence or absence of disease. An added benefit of this approach is that each pixel on the screen can look for different biomarkers, or measurable indicators that can be used to diagnose disease, to look for a variety of illnesses or health conditions. Blain Christen, a faculty member in the Ira A. Fulton Schools of Engineering, also wants to enable these sensors to communicate with mobile devices, leveraging the computing power we all carry around with us in our smartphones. “This way, it’s delegating diagnosis and monitoring to machines, so physicians and health-care professionals can dedicate their time to treatment,” she said. In addition to saving time, designing the patch to communicate with ubiquitous mobile devices opens new possibilities beyond point-of-care applications. “There’s a huge availability of these devices that are really powerful computers,” said Blain Christen, who envisions using that power to collect location data to aid in epidemiological studies. As an example, she points to developing nations, where it can be difficult to determine the severity and spread of an illness. In countries with dispersed, remote populations, there aren’t adequate resources nor technology available to effectively collect data. Using existing devices, patch data could be sent to a central location for further study and analysis, providing a holistic picture of a disease or infection. The patches are designed to be cheap and disposable; they can be used one time and then discarded — another positive for their use in the developing world. “A lot of different electronics components have gotten smaller and cheaper, so we can put more advanced capabilities into this thing while making it smaller and still retain the same kind of cost point for the technology,” said Blain Christen. Such affordable, disposable devices have a range of applications — for instance, use as a rapid screening device for people entering a country from a region afflicted by Zika virus, Ebola or dengue fever, so that infections can be detected before they spread. In addition to curbing epidemics and quickly identifying disease, the patches are being developed with sustained diagnostics in mind. Blain Christen and Anderson collected sweat samples to measure stress biomarkers to aid in the development of timed spot sensors — sensors that collect data over a period of time. The collaboration between Anderson and Blain Christen began about three years ago. Blain Christen, who did her post-doctoral studies in a clinical lab at Johns Hopkins University, has long been interested in biomedical devices. 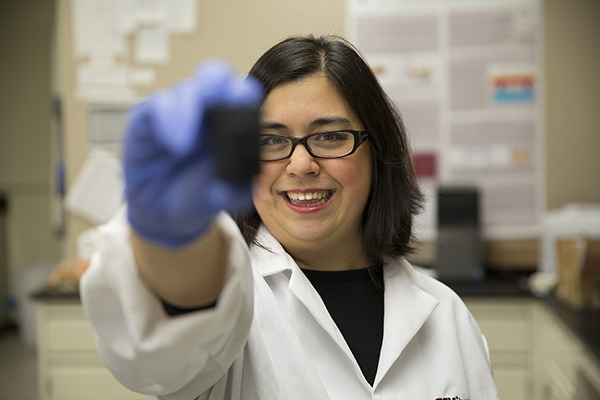 When she first started at ASU, the Biodesign Institute was one of her first stops, where she began looking for research collaboration opportunities. After an emphatic response from Anderson, Blain Christen knew it was the beginning of a great working relationship. Likewise, while Blain Christen’s work is based in electronics, it’s the application of her research to other areas that she finds the most rewarding.